Serving Kitchener Ontario and surrounding area. * assumes original film has sufficient detail and contrast levels to process, is not already over or underexposed or has focus problems. For a quote call us 613 836-9683 or Email: at support@homedvd.ca for further details. Our premium frame by frame film conversion system offers excellent film to video transfers, full frame edge to edge capture, clean, crisp, rock solid registration, no hot spots and guaranteed flicker-free results, rivaling Hollywood sanctioned Rank systems but at a significantly lower cost. HomeDVD’s high quality movie film to DVD transfer process offers new life to your old home movie collection, whether you have amateur or professional 8mm films, Super 8mm films or 16mm movie film formats to be converted to DVD. Once digitized and transferred to DVD or a hard drive, your restored family films would be fun and easy to watch right in the comfort of your living room. Calibrated to broadcast standards, your digitally converted movie films are adjusted to bring out the best possible color richness and contrast levels for which film is known, while keeping any apparent film grain aspects to a minimum. Blacks are deep and whites are crisp, all without creating hotspots and not losing any of the existing image detail at the same time. 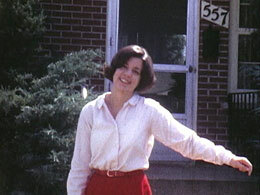 Our process attempts to keep the true character of the home movie itself and that is what makes it so great to watch. Want High Definition instead? Same film prep, just in glorious HD. Click Here. Our goal is to provide continuous watchable video when the film digitization and conversion process has been completed. Effects of aging, results of poor lab work, poor storage environments and film abuse (tears, scratches) may be present in the films that are transferred. These visual anomalies are kept as they are presented. However, we can offer restoration services to minimize or outright eliminate most of these film anomalies using sophisticated software tools, without affecting the original underlying image quality. If this is of interest, please give us a call for pricing and more details. 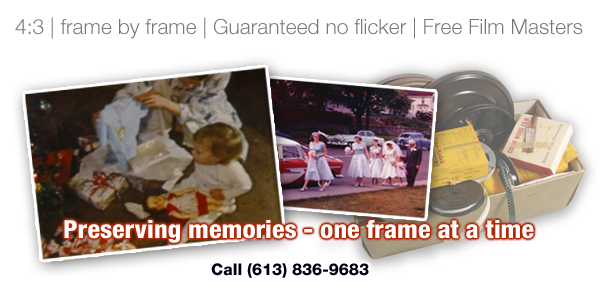 Our frame by frame film to video conversion system or telecine method scans each film frame one at a time. The special projector, having no spinning shutter and an enlarged gate, ensures that no annoying flicker is produced and that 20% or more image area of each film frame is exposed for capture yielding 100% edge to edge film frame capture. The use of a white balanced cool LED light source instead of a hot bulb guarantees not only the safety of your films but greater control of how light is distributed over the entire film frame while the capture process is underway. No intentional unsightly blooming, color shifts and mixing, edge softening and loss of focus. The result is nothing short of amazing: incredible image detail, full frame, excellent color rendition and sharp clear video sequences. Great 8mm, Super 8 and 16mm film conversions of your home movies to DVD as you would expect from a professional film to DVD transfer bureau. Our home movie to DVD transfer services has never been so complete and so affordable. 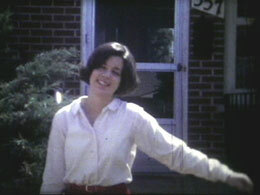 Below on the left is an example of a fairly old 8mm film frame (1950’s) of average quality, captured using the best of a low cost real-time telecine technique (lens and mirror transfer box or older direct film to composite video projector like an ELMO TRV). What is not apparent is the flicker as this a motion artifact. The frame on the right is captured using our frame by frame telecine system—an all digital, high resolution 3CCD imaging system, producing exceptional sharpness and color reproduction. Cheaper forms of telecine usually have problems with flicker, image cropping, poor color, poor focus, blooming, hotspots and have that general washed look—no depth. Costs are low, but so is the quality. The frame by frame film transfer to DVD process used by HomeDVD and other professional media transfer studios do not exhibit any of these shortcomings. Outstanding quality at an affordable price. HomeDVD transfer of your home movie film reels offer complete flicker elimination, richer colors, crisper images and recovery of up to 20% of each film frame, producing a greater field of view per frame. The quickest way to contact me is by email.